Our Abpromise guarantee covers the use of ab53977 in the following tested applications. WB 1/10000. Predicted molecular weight: 40 kDa. VP1 is one of three simian virus 40 (SV40) capsid proteins. VP1 assembles into pentamers which have a central cavity that contains a copy of one of the other capsid proteins, VP2 or VP3. This complex is then imported into the cell nucleus. Here, 72 of the complexes assemble around the newly synthesised viral genome to form the icosahedral capsid. 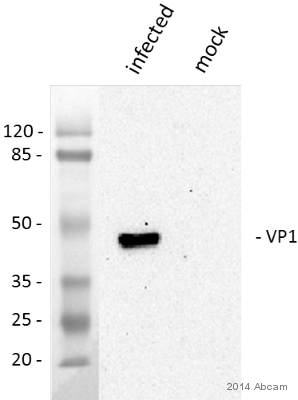 ab53977 detecting VP1 by Immunoprecipitation. Mock or SV40-transfected CV1 cells were lysed with RIPA buffer. 100 µg total protein from each lysate was pre-cleared for 1 hour and then immunoprecipitated with alpha-VP1 1/1000 overnight at 4°C. 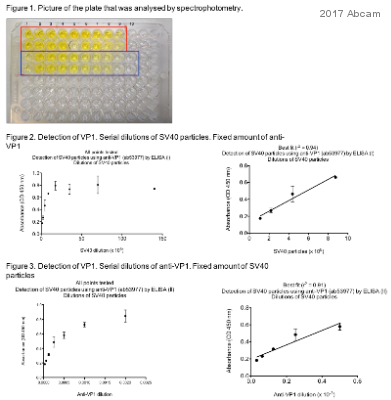 Input and IP samples were run on an SDS gel and detected with alpha-VP1 diluted 1/10,000 using the ECL method. ab53977 at 1/1000 dilution, staining SV40 VP1 in transfected cells. Cells were transfected with SV40 or mock-transfected, fixed for 5 minutes after adsorption in 100% methanol, blocked and stained with the antibody for 1 hour at room temperature. Cells were washed and stained with an Alexa Fluor® 488-conjugated anti-rabbit antibody. DAPI was used to counterstain the nuclei. Publishing research using ab53977? Please let us know so that we can cite the reference in this datasheet. Thank you for your enquiry and for your patience. We aim to get back to customers within 24 hours and I am sorry this did not happen on this occasion. I have attached the MSDS for ab53977. This is now also available on the datasheet. I understand this is a whole serum antibody and not a purified one, but do you have an estimated concentration range? Thank you! The supplier of the antibody was unable to provide a concentration, although I can tell you for rabbit antibodies typically the IgG is 12 - 15 mg/ml. If you did need a more specific concentration you could purify the antibody with a kit such as our Antibody Serum Purification Kit ab109209 (which uses Protein A) and then test the concentration yourself. Please let me know if I can be of further assistance. Thank you for your enquiry. I can confirm that ab53977 SV40 VP1 antibody detects infecting SV40 in the cell during the first hours of infection, before new VP1 is expressed from the incoming virus. I am sorry it has not yet been tested tested it against BK infection. We would assume it would behave the same since it cross reacts with BK and since their capsid structure is similar. However, we can't guarantee it without further testing. I hope this information is helpful to you. Should you have any further questions, please do not hesitate to contact us. Thank you for your enquiry. I have received confirmation from the originator of the product that this ab53977 do cross-react with JC and BK, and in-fact give very good signals with pathological specimens. However, it cannot be used to distinguish between these viruses. I hope this information will be helpful. If there is anything else that I can help you with, please do not hesitate to contact me.